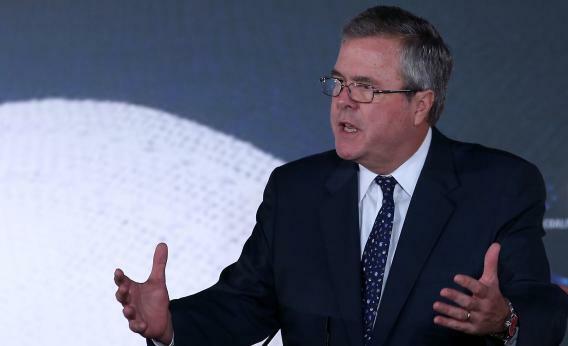 Faith and Freedom Coalition conference: Jeb Bush says immigrants are more fertile. Former Florida Gov. Jeb Bush speaks at the Faith & Freedom Coalition conference, June 14, 2013 in Washington, DC. The emerging theme on day two of the (deep breath) Faith and Freedom Coalition’s Road to Majority conference is the womb. Conservatives use it. Conservatives respect what’s in it. Liberals don’t—they have fewer babies, and they keep abortion legal. According to National Journal (and my Twitter feed), Bush’s comments made people angry. Their beef is with the word “fertile”—if you’re a stickler, it means the ability to have babies. You wouldn’t say that a 29-year-old female lobbyist who chooses not to have kids until she’s 35 is “infertile.” But this is pedantry, and pointless—it’s fascinating that Bush would up and tell conservatives that they should embrace immigrants because their higher birth rates will keep the welfare state humming. That’s not a good reason for them! They see a future in which single liberals have one or zero children while conservatives produce armies of Duggars who will outvote the enemy.